A currency note is mutilated when its original size of the note has been reduced / lost through wear and tear or otherwise torn, damaged, defaced, burnt, decomposed, shredded, contaminated, or perforated etc., through various actions. The condition of these notes requires special examination to determine its value. Mutilation, alteration or defacement of currency notes is an offence under the Monetary Law Act (MLA) No.58 of 1949, and is punishable by imprisonment or a fine or both. 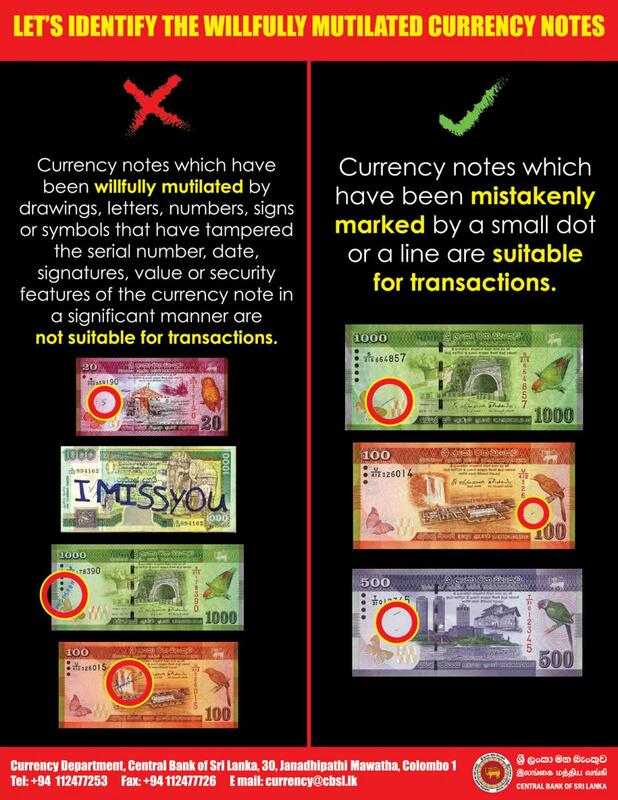 Under the Regulation “E” of MLA, no claim in respect of the wilfully mutilated or altered notes shall be entertained and such notes shall be retained by the Central Bank of Sri Lanka. The holders of these currency notes will have to suffer the loss of face value of such notes. Regulation “E” of Section 56 of the Monetary Law Act No.58 of 1949 gives the Central Bank of Sri Lanka the authority to refund the value of currency notes if they are damaged due to unavoidable circumstances such as by fire, floods and attack by insects and pests. However, the value of damaged or mutilated currency notes are refunded as an act of grace and no holder is entitled as of right to claim refunds for such notes. Refund procedures for mutilated or damaged notes are specified in the Monetary Law Act and redemption of value will be made strictly in terms of the instructions contained in the Act. The Note should be genuine. The remaining portion of the note should be at least ¾ the size of the original size of note. It should be possible to read in full at least one of the serial numbers. If the note has been torn to several pieces, it should be identifiable as pieces of one and the same note when adjoined together. The remaining portion of the note should be not less than one half of the original size of the note and should be in one piece. The serial number should be complete and clearly identifiable. Special cases for refund will be considered on a case by case basis by CBSL.